Photo by Kenji Wardenclyffe. 2015. Like thousands of others, I was struck by the above image captured by Kenji Wardenclyffe at a recent Reclaim Australia protest in Melbourne, Australia. The man in the sunglasses was part of a larger counter-protest against the racists and the photo captures a moment of confrontation between the two groups. The photo reminded me of a couple of images that have captured or symbolised the essence of Aboriginal resistance in Australia. One of my favourites is the image below taken by photographer Mervyn Bishop, an Indigenous man himself. Mervyn Bishop. ‘Town Picnic, Brewarrina’ . 1966. 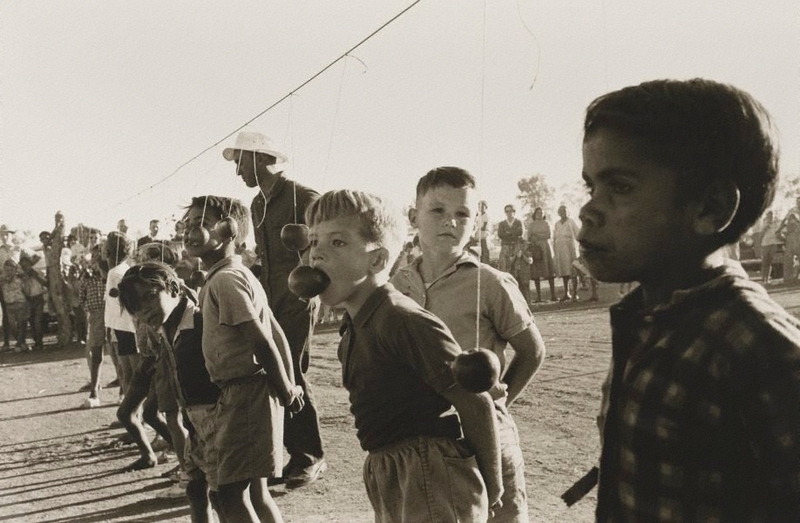 It was taken when Bishop was a young news photographer with the Sydney Morning Herald in 1966, and the young Aboriginal boy’s refusal to eat the apple, to be part of the white man’s game, maintains a powerful resonance today. A more famous photo is the one below of Australian footballer Nicky Winmar‘s physical response to racist taunts directed at him from spectators at a football match in 1993. As captured by photographer Wayne Ludbey, Winmar shows pride in his skin colour. Nicky Winmar. Photo by Wayne Ludbey. 1993. Winmar’s bold stance on the football field and the resulting images forced the Australian Football League (AFL) to address issues of racism within the sport. Today, the AFL is one of the leading organisations helping to fight against racism in Australia through its Multicultural Program and other initiatives. The physical and facial expression of stoicism in the face of ugly oppression is the same in each of the above photographs; exterior calmness, back straight, head-up, standing strong, solid. 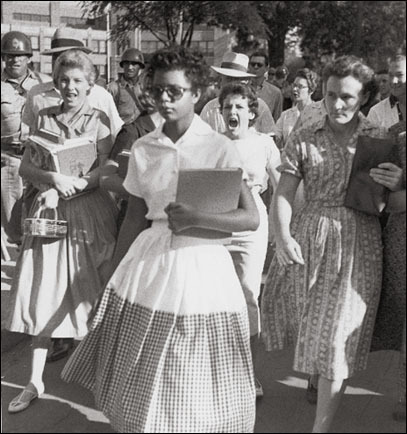 The same expression can be seen in one of the most famous images of Black resistance from the USA; a photograph of schoolgirl Elizabeth Eckford being racially abused on her way to school in 1957 as captured by photographer Will Counts. Elizabeth Eckhart. Photo by Will Counts. 1957. Eckford was among the first black students to attend a previously all-white high-school in Little Rock Arkansas following a Supreme Court ruling that it was unconstitutional for schools to be segregated on the basis of skin-colour. This photograph was circulated around the world and deeply embarrassed America at a time when its government was trying to promote a national image more consistent with its stated ideals of equality, liberty and the pursuit of happiness. Interestingly, one of the chief abusers in the photo later renounced the racist ways of her youth, apologised to Eckford and the two became friends. The concerns of black people are rarely represented on the TV news in Australia, whilst prime-time Australian TV appears to have a white Australia policy. The most recent of the above photos has left me with mixed emotions; thankful that in this digital age these powerful, world-changing images can still be captured and seen across the globe, but saddened that these photographs still need to be taken as the same old irrational fears and hatreds remain. Through the actions of people like Winmar and Eckford, and the images captured by people like Bishop, Ludbey and Counts, the ‘invisible’ are made visible. These images demonstrably changed society for the better. 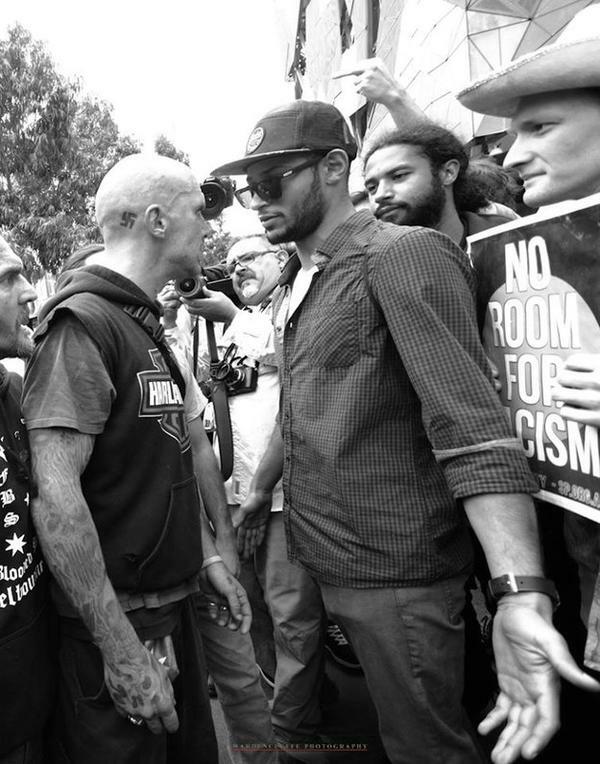 Likewise, the actions of the man in the sunglasses at the Reclaim Australia rally and Kenji Wardenclyffe’s photograph has contributed to the positive momentum of change against racism in Australia, and for that they must be congratulated! Sources and footnotes are on the next page. Previous Post Cultural immersion trumps theoretical knowledge in international business. Next Post Australia-Vietnam relations. Building trade, social capital and security through culture in Asia.